As you can see, I’ve been having issues getting good swatches here since I moved into my husband’s condo a couple of months ago! We actually already sold it and are looking for a home back in Orange County where we both lived before. Soon I will have a home where I’ll get some good swatching light, but until then, I’ll continue posting swatches that I think at least show the polish, even if they aren’t in the same spot all the time. Its only temporary! I got a new job too by the way, no more military stuff, no more clearances… I get to work in OC again! I just got Zoya’s new Blaze, let’s see if that one comes next… I do have a lot of great browns I’ve been waiting to try! 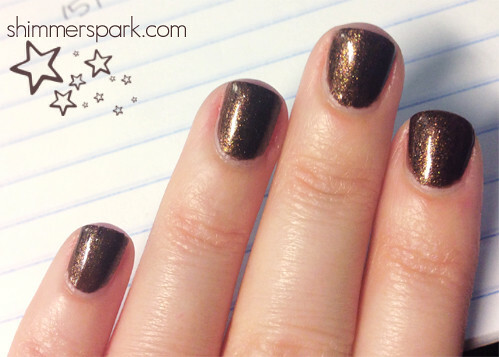 This entry was posted in general polish yumminess, swatches and tagged brown, chocolate sprinkles, milani, nail polish, sparkly, swatch on October 13, 2012 by hollyshimmerspark. When I got OPI – Catherine the Grape, I loved the color, even though I don’t usually like purples… so I went and got the other 2 purples I had gotten recently and left the Savina – Merlot on one nail from last time so I could do a comparison. I don’t have Gamer Glam anymore, but I kept the other 3! I have so much to type but my wrist is still a little screwy… it looks really bad actually! I wanted to try the Shellac formula so I got myself a little UV lamp and the base, top and color coats. I put it on this weekend since it is supposed to last for weeks and I’m having such a hard time painting my right hand right now since my left one doesn’t want to work right just yet! I’ll post about that soon with a video… and I’m going to do a tuffscent.com giveaway of a bottle or two! This entry was posted in general polish yumminess, swatches and tagged catherine the grape, china glaze, gamer glam, hi res, holo, holographic, merlot, milani, nail polish, opi, plum, purple, savina, shimmer, swatch, tronica on August 9, 2011 by hollyshimmerspark. I probably just had to get this one because of the name itself… I kind of threw it in my cart when I was buying other things. I really like it! Its one of those brown shimmers that has a reddish tone to it. I swatched all of my browns that are a little reddish so that I could compare them. I’ll post that comparison soon! This entry was posted in general polish yumminess, swatches and tagged brown, brownalicious, milani, nail polish, shimmer on June 17, 2011 by hollyshimmerspark.